I had first read the post on Magh mela on Arti’s blog, when I was looking to become a virtual pilgrim. I was immediately hooked to the way she took the reader on the trip along with her. But it was with her posts on the various avatars of the Ganga that I became her devoted follower — we both share the reverence and awe of the divine river. Her innate spirituality comes through in her posts, making them even more engrossing. This is not to say that she only writes on pilgrim destinations. Her posts on her trips to Japan and other places are equally enthralling. Her posts are comprehensive with every detail that a traveler would want to have – places to stay, where to eat, what to see, how to get there…When I met her last year, I was pleasantly surprised to find a young girl and not a middle-aged woman I had always thought her be! Arti blogs at My Yatra Diary. In this guest post — one of her rare personal ones — my young friend takes a walk down memory lane to the Diwali of her childhood, illuminated by the glow of the diya. 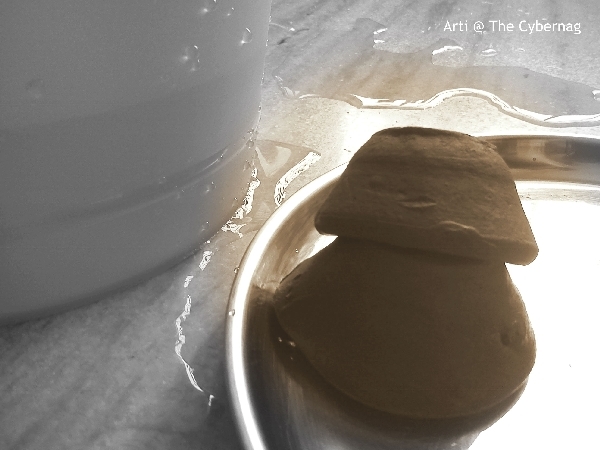 Read on…..
Dadaji, look I have finished washing the diyas! Very good, now take them carefully and hand them over to your dadi in the rasoi. ……I had been seven, maybe eight then. The entire family would come together during Diwali, for the festivities at my grandparents’ house. Everyone had his or her job cut out, whether it was dadiji writing out a list of ingredients for the rasoi, aunts bringing out huge cauldrons from their kitchen shelves and uncles running around to get their crisp cotton kurtas readied for the day. 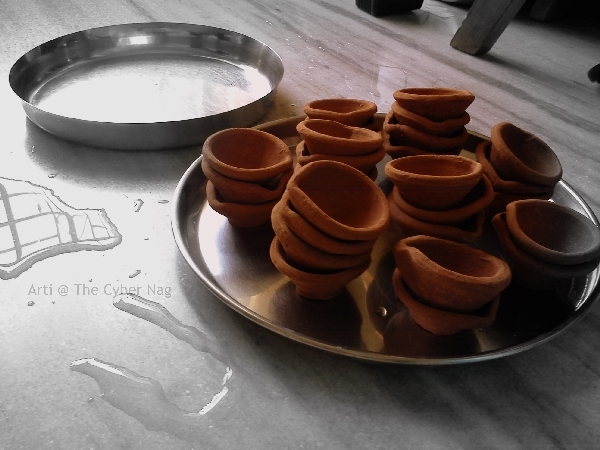 Amidst all this hullabaloo, I was assigned a job too — of washing the earthen diyas! It made me feel very important. Arti, will you wash the diyas for me? Yes Dadaji, sure I will! A day before Badi Diwali, I would excitedly run down to my grandpa’s house, a storey below ours, to find a small bucket of water, a steel plate full of diyas and an empty plate to hold them after washing — waiting for me. One by one, I would pick them up, soak them in the water and gently stroke them clean. It didn’t take long for me to realize that this was not a job — it was pure fun! I watched in fascination as the water changed color as did my fingers. The entire activity induced an odd sense of contentment. I felt good to be trusted with a job that felt very important to me, to be part of the preparations that the elders were busy with. Perhaps that’s what inspired the festive spirit in me then. At the end of it all, the bucket would be half empty with water splashed all around and there would be wet patches on my frock, but my gaze would be fixed on the plate loaded with the clean, damp diyas carefully arranged by me in neat stacks of three. Not a droplet of water in it — the plate would be a clear mirror. In it, I could almost taste the earthy smell of the diyas and my hard work — cool, crisp and light. Dadaji, I have given all the diyas a nice bath. They are now ready for tomorrow’s puja. Arre waah, bahut hoshiyar hai meri poti toh. His loving words, his effervescent smile and his compliments meant the world to me. Such was the glow of accomplishment; such was the magnitude of the pride I felt in my job, that I couldn’t wait for the next day to dawn. on top. The quantities were not enormous but I remember my grandma always putting away a part of these tempting pakwaans in separate containers even before the puja commenced. Why are you taking out the kheer from the kadai, dadiji? It is for the watchman uncle, kusum maushi, her kids, the subziwali aunty and so many others who serve us all year. Today is our turn to serve them, dear. Meanwhile, the living room would be abuzz with the preparations for the Laxmi pujan going on in full swing with none other than dadaji directing the proceedings: The preparation of the altar with a picture of Laxmiji with Ganeshji and Saraswatiji pasted on the wall, a copy of Bhagwad Gita placed on a Lal pata, a few silver coins placed in a row; and other preparations like making cotton wicks, stringing flower garlands; and finally, placing the big diya in the centre, with the smaller ones arranged at a lower level as if they were sentinels guarding it. Then each would get a wick and oil, ready to be lit. All the offerings — fruits, kheele, patashe and the pakwaan would be arranged around the altar. Seeing Dadaji take care of all preparations to their minutest detail and observing his unwavering devotion, I realized even at that tender age that Diwali was indeed the biggest of all Hindu festivals. Before the puja began, the smaller diyas would be lit one by one, followed by the big one. That signaled the commencement of the Arti . The clapping of hands, the tinkling of bells, and the voices joined together that soon rose to a crescendo in the culmination of the divine song. …Bolo Laxmi Mata ki Jai! As the song slowly faded out, the noise of the crackers outside would assault the ears but I would find myself drawn to the beautiful radiance of the big diya…..
Years have gone by, times have changed…..so much so that the warmth and bonhomie of the ancestral home and the extended family slowly became distant, the tins of hand-made laddoos came to be replaced with big boxes of store-bought mithais and the new dress no longer remained exclusive or special…. Why is one diya big and the others small, dadaji? I shake myself from the reverie I had sunk into. I look at the glow of the large diya and see that it is still as captivating as it had been when I was a little girl. The soft echo of the voices continues to ring in my ears over the noise of the crackers outside — its nostalgic glow reaffirming the real spirit of the festival, which dadaji had instilled in me. correct manner. Thanks for this heart felt post Arti. Thanks, DS. Well said. Also, the lessons that we learn from our grandparents are rarely forgotten. It’s one of those bonds which is difficult to express in words – IT is a precious gift from God. Zephyr thank you for allowing Arti to spread her wings and words to others who may not have read her blogs. She is most gifted in her ability to take one back to whatever moment, time or travel she is sharing with insight and soulful creativity. Arti no matter where your travels or words are shown, you always have a light shining in you. Carrie, the only source of my light is the loving warmth of caring people like you. I’m truly overwhelmed by your kind words… Thank you very much for just being there and making this world the most beautiful one for me. Thanks for introducing us to Arti and her blog. And thanks for inviting her as a guest blogger. It’s a very touching story. It’s seems to bring back childhood memories of all the commentators here. Beautifully written. Happy to be introduced to you, Otto. It was an honor to be invited as a guest at Cyber Nag and a pleasure to interact with all lovely people here. I love your posts Arti… I enjoyed this one… It was so touching! Every time you blog and I see so many comments, my heart swells with pride. And to see so many guest blog posts on your blog from old and young, new and popular; the Cyber Nag today is the breeding ground for strong relationships, friends and bonds sewn by something we call the blogging. Its good to see one of the best travel bloggers in India today do a feature here. And you keep up the legacy of brilliant blog posts this time around as well. Loved the pictures and how they evoke strong emotions in every Indian because its a festival each one of us celebrates in some form or the other. We don’t burst crackers, or have elaborate proceedings but these pictures sum up the we way we do it each year. Simple and close to the roots. I have been staying away from home for so long, but never forget to light a lamp during Diwali. Hope your Diwali was even more colorful than the pictures you have shared. Thank you Vinni for the endorsement and the appreciation. Hosting friends on the blog is a pleasure and when they find friends and followers from my space, I feel as happy as a good host feels when her guests enjoy the party. The comment field is open for discussion and airing of new perspectives and fresh ideas without reservations. I learn so much from them and am sometimes stumped for replies, so erudite and great they are! Arti was very sweet and has pulled out all stops to do this most beautiful post for me. It’s really nice that you never forget to light a lamp, I’m sure that helps you connect to your loved ones far away from you. And why only family, the sparkle radiating out from these Diwali lamps is something that, I believe, leaves out no one — enveloping one and all in it’s warm blanket of love, joys and unitedness. Thank you Vineet, for your heartwarming appreciation. I am a raw writer and a very simple travel blogger. Every time I write down something and find people appreciating it, I’m only left humbled by their overwhelming love and kindness and nothing else. Wonderful images and equally lovely style of writing- Arti, thanks for the lovely share. Zephyr- thanks for the feature:) Belated Diwali wishes to you! Thank you, CN 🙂 Glad to see you here. Belated wished to you too! What a lovely post – so simple and kind. Full of light! Ahh…nostalgia…so seductive…so tough to let go of..I could picture that dreamy eyed girl carefully dipping the diyas in that bucket of water and tenderly patting them dry. What a beautiful post you’ve written,Arti. I loved this post so much!! It too reminded me of childhood and the simplicity of yester-years!! Thank you very much, Arti and Zephyr!! Wishing you both a belated happy Diwali! Beautiful post, Arti. Brought back some fond memories! Best wishes (though belated) for Diwali to you and Zephyr! Thanks, Girl 🙂 Best wishes to you too, belated! This is an excellent writing on Diwali and its ethos in our younger days. The culture, its meaning and its relevance has got diluted today. Probably we live in a more materialistic world where a holiday means more money, shopping, holidaying abroad, etc…..its like you want to buy something to be happy…not about enjoying, relishing or appreciating the togetherness or the spiritual aspect of it. I would be happy to add a Guest Post on my blog Sekhar’s Page if you get time to contribute one. Thanks and wish you a Happy Diwali. appreciation and invitation. You have a wonderful space and I would’ve loved contributing but the thing is I am actually a travel blogger and posts like these are very rare from my side. Right now, I dont think I will be able to keep the commitment, hence kindly excuse me for the same 🙂 Wish you a happy and prosperous year ahead. Nice post. The place where I live, I could find all the rustic dias from the kumhars and also the regular matkis. I was happy that I could celebrate it the way I wanted to. What a beautiful memoir, Arti! Loved reading it and loved the images of Diya. Diwali is more about family than about the festivities.. For me, it’s all about meeting, greeting and remembering the roots, the people and place where we belong. Arti, loved the third image. It captures innocence and beauty together. The post took me down the memory lane. Sadly Diwali has been overcast with the dark shadow of consumerism. Its more about gifting and burning notes….oops crackers. Hi Zephyr & Arti,this is a lovely post so endearing & sentimental.One feels a direct connection to all the preparations—-very well written. Thank you Zephyr for hosting Arti for this wonderful, moving post. I could smell vividly the wet earthen diyas, know the joy of this task, and marvel at the beauty of this practice. How blessed are you to have such lovely memories. It would be impossible to tire of reading your splendid writings Arti. happy week to you. Hi Becky, thanks for your visit, though I know Arti’s charm brought you here 🙂 I wanted to visit your site, but it is not opening. Could you please give me the correct link so I may visit you too? Wow, you summarized the post so beautifully. Thank you 🙂 What you have said here is exactly what I had wished to convey through this piece – to highlight the values of love, lights and joy – that our festivals emphasize on and not on firecrackers or other flashy things that we have come to add on today. Thank you for reading the post so wonderfully well, thank you for touching its spirit 🙂 Wish you a very happy new year! What a fascinating story Arti. Not just loved but felt every moment you have shared here. The Sanskaras you are sharing by your presence, writing and all the work are the treasure for all of us. We are blessed to have a friend like you. Very glad to see your thoughts on Zephyrji’s blog. Keep writing…. Hey Mohini! Long time! I am so glad Arti brought you back here 🙂 Do visit again. Very well written, I felt I was there with you and your grandfather. Thanks for sharing. such a sweet response, thanks Arti. 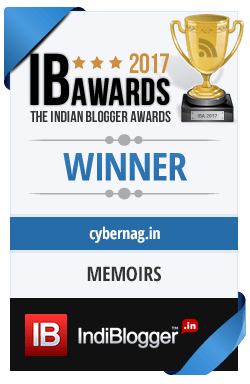 Being new in the world of blogging it is sure encouraging! This is such a sweet post, Arti!!! Something that is truly you…I loved reading it and experiencing your life up close…Happy diwali Arti!!! May you be able to have small and big diyas always in your life! Thank you so much, so happy you loved reading one of my personal pages on Cybernag’s diary. I also wish your path always be illuminated by loads and loads of all sized diyas always 🙂 Happy new year! Having seen your blog mentioned at Arti’s My Yatra Diary I thought I’d stop by and say hello. A great post, I’ve really enjoyed my visit. Happy Diwali to you and yours, PW. Thank you for your visit Petty Witter. I do hope you like what is here and will visit again! Now off to visit yours 🙂 Thank you so much for the Diwali wishes. Welcome to CyberNag Tracy, delighted to see you stopping by. Thank you, please check out Zephyr’s articles also. She is a gem of a writer and I’m sure you will love them. hmmm so much tradition and things , I had no clue whatso ever, I do remember though putting the diyas in water t osoak and then having oil and lighting them on at night..
no jokes apart , i agree we have to follow some traditions else we will lose them in the next gen.. Wonderful post with dollops of warmth and love and those memories are priceless! Yes, priceless are those memories and they also make me miss them so much. I appreciate all that our grandparents and parents did to preserve and carry on the family traditions. The fantastic memories still linger in our minds…. and we look forward to all festivals with enthusiasm! We have reason to celebrate , pretty up, cook up a feast and what not…. How nice to hear that, Ma’am! I agree, we do have reasons today for appreciating the goodness our rich festivals bring along, thanks to the loving foundations set by elders like you 🙂 Redesigning is something we all do at some level and I feel is fine also as long as care is taken to retain the real essence of the festival. It was such a beautiful post, it contained the true feeling and meaning of Deepavali. “The big Earthen diya is to guide the Godess’s path into our world and the smaller ones are meant to guide our path into Her’s”. Really a great thought. Thank you for sharing your fond memories. Thank you Ashreyamom for the Diwali wishes. Wish you a colourful Diwali too! Congratulations Zephyr for roping in Arti for this post. brought back hordes of memories. Arti.. I did the diya washing too with my sister. Mmmmm.. the smell of freshly washed diyas is still with me and the kheer.. mouthwatering. It’s a blessing we lived in a joint family. happy Diwali to both of you and your families. I did the diya washing yesterday and that smell is something that I will carry on till the next year. One thing that I absolutely love about joint families is you get to learn so many things that nuclear families fail to do. Nostalgic,this brings back the memories of childhood days starting from counting number of days for Diwali holidays to begin and all the fun with crackers & sweets. We used to divide the crackers amongst brother & sisters but still used to fight for more. What a fun. Sweets was something I looked forward too. 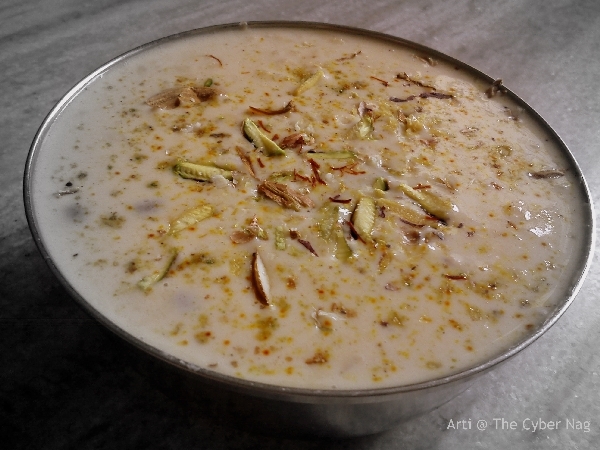 I never bothered whether others got their share, being the smallest kid of the family, and waited for the puja to get over soon so that I could get my hands on the Diwali kheer and then have it to my heart’s content 🙂 But yes, whatever it was – It was fun. Yesterday I went to buy sweets for Diwali and was wondering where all the old diyas have gone. The market was filled with designer diyas in various shapes and sizes. Although, they look pretty, they somehow take away the simplicity of the era we have lived in earlier. I did not buy them because I don’t think everything needs to be flashy. Thanks Zephyr for this post. Wishing everyone a very happy Diwali. Me too, Amit. I am tired of designer diyas and designer kalashes. I wanted a mitti ki choti matki and could not fine one :(. Why, is there no demand anymore? Hi Naina, Thank you so much. I managed to find them at a kirana store :). that light from the lamp is so magical to see Arti, and I just learned now that your name is related to that light from the lamp as prayers offered with a lamp. so beautiful post, thanks for sharing the meaning of celebrating Diwali. happy Diwali to you. Indeed magical, betchai. If you observe it for a good length of time, you feel its glow connecting you to a different world of a higher order. Arti means prayer, the hymns sung in the glory of the Lord and most often this is done after lighting a lamp. Lights, love for elders, finding joy in the little good things of life is indeed the real spirit of the festival and I am grateful to my elders for introducing me to the same from an early stage in my life. First of all, what a lovely tender post, Arti! I have found some amazing bloggers through your blog, Zephyr! Thank you for introducing me to Arti. Now coming back to the post, Arti, you took me right back to my childhood years, where all diwalis were spent in my nana’s house in a small town in UP with my uncle, aunt and cousins. Those were truly festive days. We kids would get busy with those snake thingy, pistols, and crackers etc. Mom and the ladies would make yummy treats to eat. I especially loved the kachoris mom made. The simple laxmi-ganesh poojan, beautiful diyas in every part of the house! On Badi diwali, they were kept lit all through the night. And, of course, all 4 days of the festival celebrated with gusto and culminating with bhai dooj. All kids wore new clothes, though I distinctly remember dad and mom something foregoing that. My heart reaches out to those memories. Diwalis became so very different when we moved to Mumbai. How could I forget the massive cleaning that took place at that time? Now with my own family, I miss these occasions and especially my mom. I try to still do the laxmi pujan this way. Cleaning and kachoris are still done religiously :). But these days, it is more about dressing up and putting expensive lighting or giving expensive gifts. Friends just wish you from the doorstep and buzz off. No one has time to come sit and share tales. These are the simple things I so miss. Thank you for this post, and wish both of you a very happy and prosperous diwali! Thanks, Rachna. The guest posts at Cybernag does a great job of connecting bloggers! You seem to love your childhood memories too. I also remember those moong dal kachories being fried for the visiting guests the next day after Diwali. And how could I forget the fresh coat of paint/ chuna ahead of the big day. The charm of all this today no longer exists 😦 We do tend to miss the olden days, one reason being the genuinity that would be infused by all back then: Less of show and pomp and more of spirit and friendly bonhomie. There were no signs of ecards or phone messages and this was one time in the year when the entire family looked forward to meeting and greeting each other personally. But as you have rightly pointed out, no one has time today and everyone is busy in doing his own work… His way. My first introduction to Arti was also my first to any other blogger. The Kissan contest had her post about her Grandpa planting a Tulsi plant along with her and I found that very moving. After that, this is the next personal post I think. Thanks Arti for taking us on this lovely walk down your memories and thanks Zephyr for getting Arti to take us along on this journey! That’s right. This is the next one after the Tulsi post. Thank you for walking with me along this one too and Happy Diwali! Such a beautiful post to light up a Deep for Deepavali! Thanks you very much, Sir! Glad that you liked it 🙂 Shubh Deepavali to you and your family! Lovely post Arti. The subtle Diyas, the sweet, and the memories, the sharing and caring … Wow. That is the way to celebrate. Bring back the beautiful memories in our lives is nice thing. Especialy if the memories remind us about the value of kindness in a moment. I hope all the glowing light of diya will bright your life Arti..
Wow! We all have something in common from our festival celebrations memory box, don’t we? I remember how I used to proudly run around showing my new dress to glory to all my relatives and well wishers. And how my heart would jump in joy when someone made a nice compliment for it! Sure, will check out your space. I just had a glimpse of it. OMG, you are an avid traveler.. 🙂 We live in the US. A lovely post Arti – it lights up my soul! Will participate in Diwali in my own little ways, for light is what we need right now! Happy Diawali, blessings! That is the way to go, Martina! Participation is important, not the grandiosity of it and I’m sure you are going to do a great job with your colorful efforts! Thanks a ton, Martina! Always happy to hear from you! Wish you a very Happy Diwali! Since coming to “know” you over these years, Arti, I especially look forward to your writings about your childhood, so filled with love and respect for your family. I find my own heart swelling and my eyes filling with tears as you speak of your ancestors and their faithful observances. I found this reverie very moving. Thank you for sharing. From one granny to another. I am happily counting all my blessings this Diwali. It’s only love and appreciation from kind-hearted souls like you that inspires me to keep digging into my past and writing them down in the form of nostalgic posts even though I’m a complete novice. I’m really delighted to hear those words coming from you. Thank you very much Barb, really appreciate your presence and support always. How sweet 🙂 Really… moments of pure unadulterated fun and love can do that to you 🙂 They do make us chuckle once we grow up a bit, but those days were real bliss… glad we all have our share of memories to light up our (and other’s) hearts and souls. Such beautiful and nostalgic post, exuding warmth all the way! There is nothing like childhood memories on festivals like this that make you connected to your roots. Thanks for this one, Arti and the very wonderful Zephyr. A very happy Diwali to you both! Warmth is in the air, Naina! You are so right, these memories connect us to our roots and then help us grow and prosper in the right directions. A very happy Diwali to you too! Hey Naina, thanks for visiting and liking my space. Do come again 🙂 Wish you a very happy Diwali too! Hi Zephyr, my first time here.. lovely post!! In my home, the biggest diya was the akhand jyot which would be kept burning from DIwali to the 3rd day after that. And even Goddess Laksmi’s murti and the coins would stay in the milk, covered by a cloth for those 3 days.. and then the 3rd day, we would formally nahlao the murti and coins and take everything away. I am so glad that Arti took you down memory lane. She has the ability to take her readers along where she goes 🙂 Nice to have you here, Punam. Do visit again! You have made me pass through my Childhood Arti. All the things you have written here matches too my past too. We also Celebrated Diwali same as the way you did and my Babaji would always lead it. Few hours back I bought Diyas with my Mom. And the Pictures were so beautiful. First time here on Zephyr’s Blog though I am ardent follower of yours. I remember reading a post on your Babaji and I know how close you were to him. We all have wonderful memories of the times spent with our elders in our hearts, don’t we? I love hearing about them as much as I love reliving my own. Happy Diwali! Arti…this one was one beautiful post. Very evocative indeed and we could see you as a little girl learning from your grandparents. I love the festival of diyas and lights and the significance of every little thing we do that makes the festival so special indeed. Wish you and your family a very happy diwali! Zephyr aunty — Glad you featured Arti for this post. Wish you and your loved ones a very happy Diwali! You are welcome Richa. Wish you also a very happy Diwali! How was your travel? Happy Deepawali to you, Arti and to you, Zephyr and your family too! Arti, enjoyed reading this post! You took me to my childhood to my grandparents’ house! You seem to be very close to them! Yes, nowadays, shortcut methods are followed for everything! I still do the sweets and savourees at home. Hope to do it as long as possible. I want the next generations to remember me like you do about your grand parents! So I do a lot and distribute to relatives and friends! 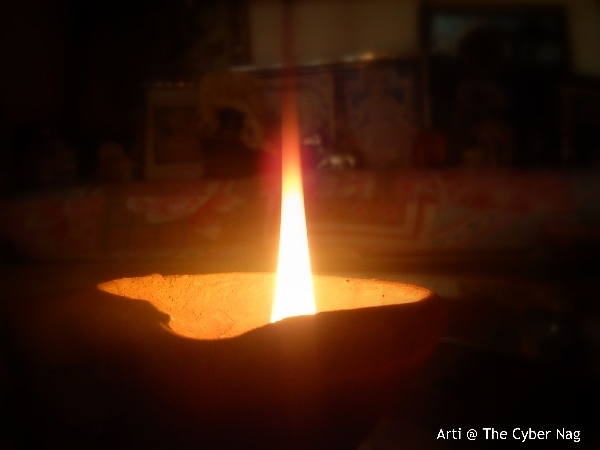 The flame in the single diya looks as if it is moving! Very nice photograph! Same to you and your family, Sandhya! 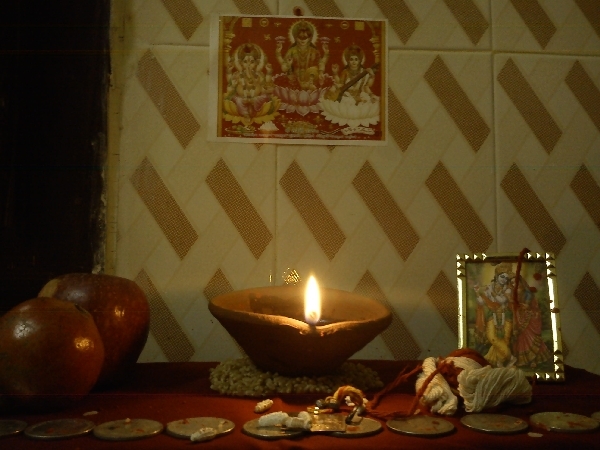 The smell of earthen diyas and the light form the lamp that is lit the whole night in front of goddess laxmi is what I remember most about Diwali. This was a wonderfulyl nostalgic post Arti and I loved reading it ! A very happy Diwali to you and to Zephyr as well ! Thanks, Maddie! I am so happy this post could bring you closer to home, so what if only in heart and mind. Here’s sending you extra warmth and cheer to light up your festive occasion wherever you are 🙂 Happy Diwali! This is such a lovely post and so timely! very heart-warming to read especially when I am so far away from home and loved ones. I’m quite the Scrooge when it comes to festivals, Arti. 🙂 But then at the same time I also feel good stuff and positivity and all the good things that come with it. Your post is beautiful and heartarming in the nicest possible way — nostalgia through childhood innocence. Great to read the post of Arti, truly beautiful post & nice photos. Thank you Zephyr , Great to visit you blog. Happy Diwali to Arti & Zephyr and all of you. Loved this post and discovered a new blogger today. Will hop on to her blog to read more of her posts. Ganges has made me fall in love too…in many cities, in many moods, the river is a world in itself. Bang on, Sangeeta. Spreading lights, love and joy and to add something more (as bhagyasree has pointed out), driving out the negativity in our lives is the true joy of the festival. That is a beautiful sentimental post. Arti’s regular travel posts are great but nostalgic posts bring sheer delight to the reader due to the warmth in them. Let the lamps this year dispel the negativity in our lives and give us the strength to carry on…. I especially liked to eat the vethlai roasted in the oil. I’ll be thinking of you as I wash my own agal vilakkus in prep for Diwali today. The beauty of earthenware is something else! 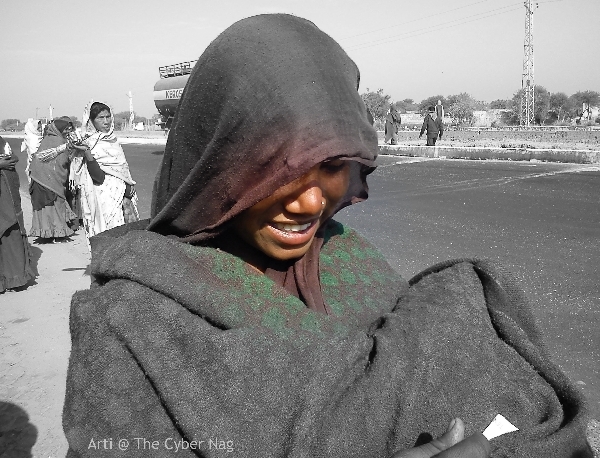 Beautiful photography,Arti and a wonderful blog post. 🙂 Happy Diwali to you! Zephyr, I’ll phone you tomorrow, okay? Hugs! Happy Diwali to you! With due apologies to Arti. Dear Arti – I was referring to brass “urns” for boiling water and betel leaves roasted in oil, And I’ll be washing my own earthenware diyas today 😀 I hope I covered the jargon.Thanks for pointing it out, Zephyr – I was just excited to read the post. Hugs, Arti – I really enjoy your blog (as a subscriber) and think this post is fabulous. I learned something very useful today – about watermarking guest post pictures – it is such a fantastic idea! You said it – the beauty of earthenware and when combined with the pleasures of a joint family – Ah! This cheered me up Zee and I am all set to take in the light and spread some around in return…Thank you Arti for this lovely post. Such a heartwarming Divali post. Much needed today. Lovely vignettes of a little girl proud and captivated to do her important work of cleaning the diyas. Learning about giving and honoring folks, from her grandma, as they set aside sweets for those who are a daily part of their lives. But what really signifies the spirit of Divali , are the photos, which she has undoubtedly clicked herself , but which bear a watermark that says Arti@TheCyberNag ! 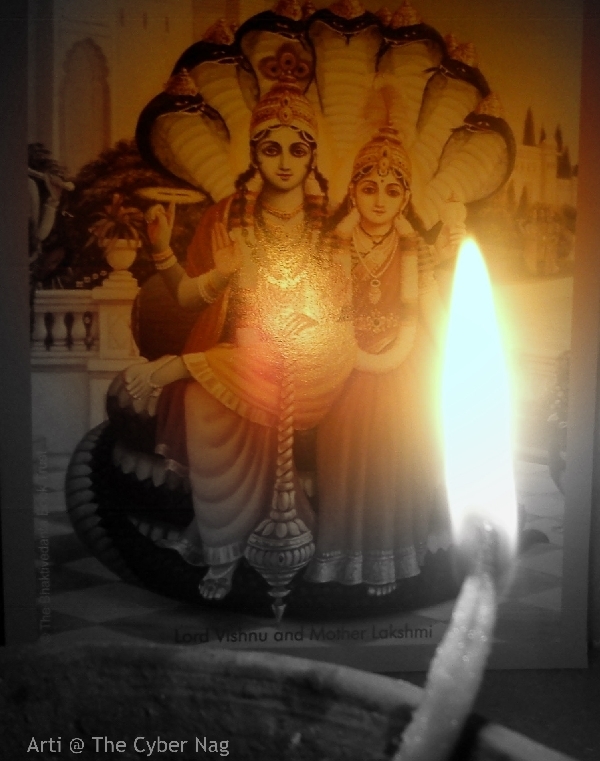 Happy Divali Zephyr and Arti and thank you for this lesson…. My grandma always believed in lighting a face as much as she believed in lighting lamps. She found a lot of satisfaction in it and inspired us to be the same. The values instilled by my grandparents have helped me immensely and I treasure them wherever I go. What a wonderful way to set the festive ball rolling. Thanks, Zephyr, for introducing this Arti. Am so accustomed to her stunning riverscapes and temples (global now), that this post was refreshingly different. And the images of the washed diyas, they are amazing. The way she has described the rituals from a child’s perspective is also very beautiful. It was such a joy back in those days to celebrate Diwali, the rituals was what brought the entire family together. The washing of Diya’s was such an integral part of Diwali (it still is) and I felt so proud to see my grandpa always keeping that work for me 🙂 I remember always looking forward to all the festivities and merriment associated with the festival as the youngest member of our family. Thank you so much for this lovely post, Arti! Knowing that you don’t usually write personal posts, I feel honoured that you chose my space to do it 🙂 I went back in time with you and heard and saw all that the little girl did and said. The pictures are all very evocative. Diwali is indeed the most important of festivals for the Hindus and is a special one for me since I love the lamps and the light they bring in to the human hearts. So this post is doubly precious for me.